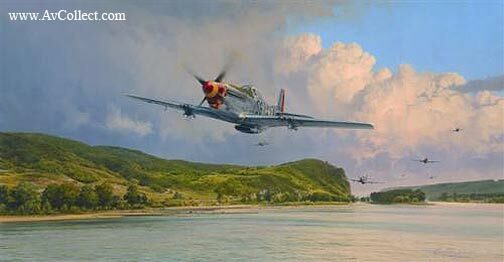 In April 1945, with the War virtually over, P-51 Mustangs of the 357th Fighter Group sweep unopposed at low level through the beautiful Rhine valley. This is the first release in a pair of prints paying tribute the USAAF in Europe 1942 - 1945 and once again Robert Taylor has produced a classic painting reminiscent of some of his most collectable releases. The edition is personally signed by up to TWELVE Fighter Aces and pilots all of whom flew in Europe with the 357th Fighter Group.